Court rejects father's attempt to keep existence of children hidden from his family in adoption case. Full story: Community Care. A guide for domestic violence and abuse victims about services from the Department for Work and Pensions (DWP). Full story: Department for Work and Pensions. A couple who have cared for their six-year-old grandson since he was born have won a family court fight after council social services bosses said he should be taken from them. Full story: Care Appointments. See C (Interim threshold not crossed), below. Delays at the country’s biggest regional divorce centre reached unprecedented levels in 2018, figures obtained by the Gazette have revealed. Full story: Law Society Gazette. Appeal by father against finding made in care proceedings that he had sexually abused his daughter. Appeal dismissed. Full report: Bailii. 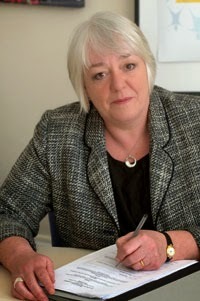 Hearing considering capacity and best interests decisions in relation to a young man with a learning disability, including residence, contact (with family and others), his care arrangements, his property and financial affairs, his capacity to consent to sexual relations, and his internet and social media use. Full report: Bailii. Care proceedings. Fact-finding hearing to determine who caused injuries to the child. Full report: Bailii. Care proceedings. Appeal by father against finding that he had sexually abused his daughter. Appeal dismissed. Full report: Bailii. Application for an interim care order in relation to a six year old boy. Application dismissed. Full report: Bailii. What will be the next great family law reform? - I look at the options. Mother did not fail to protect her children - Looking at the public law case L-W Children. Mother successfully appeals against findings of fact made against her - In the case A (Children). Is the child arrangements terminology awkward and confusing? - ...or am I just a dinosaur? Child left with life-long injuries after opportunities missed to protect him. Full story: Family Law Week. Croydon family court judge says blood relationship ‘powerful’ but not ‘definitive’. Full story: The Independent. See C (A Child), below. A group of private backers has agreed to fund a national unit supporting courts which help parents deal with drug or alcohol addiction so their children are not taken into care. Full story: BBC News. The amendments remove provision in the FPR and COPR which relates to powers, processes and orders under EU instruments or international agreements which will no longer be applicable or available when those instruments or agreements are revoked by the Withdrawal Act or the statutory instruments made under it, or in some cases amend such provision where such instruments are retained in an amended form. Statutory Instrument. Care proceedings. Appeal by mother against finding that she had failed to protect children. Appeal allowed. Full report: Bailii. Application by father for summary return to Spain of child subject to care proceedings. Application dismissed. Full report: Family Law Week. Care and placement proceedings in respect of a child born in 2017. Special guardianship order made in favour of mother's friend. Full report: Bailii. Applications by parents to discharge care orders in relation to four children, the parents having made 'extraordinary progress' since the orders were made. Full report: Bailii. Are the proposed divorce reforms just about changing timeframes? - Discuss. Judge bemoans lack of legal aid in complex children cases - The judgment of Mr Justice Williams in R (A Child: Appeal: Termination of Contact). Father obsessed with his rights fails to achieve sole parental responsibility - In the case C (A young person). Unrepresented father fails in appeal against findings of fact - The case QC v UC & Ors. A judge effectively bullied a mother into agreeing to interim care orders for her children against her wishes, the Court of Appeal has found. Full story: Legal Futures. Long-awaited change will mean couples no longer have to allocate blame or mutually consent to ending marriage. Full story: The Guardian. A new strategy to help people resolve legal problems at the earliest opportunity and avoid the need for unnecessary court proceedings was unveiled today. Full story: Ministry of Justice. New research published today by the Nuffield Foundation reinforces the case for reform of the overly complex divorce system in England and Wales. Full story: Nuffield Foundation. What to do if you are involved in a family law dispute (including divorce and child maintenance) with someone living in the EU after Brexit. Full story: Ministry of Justice and Foreign & Commonwealth Office. New rules apply in 18 Member States. Full story: Family Law Week. A High Court judge has used Twitter to urge a mother who vanished with her three-year-old son to return home. Full story: BBC News. Appeal by father against order allowing indirect contact only. Appeal allowed in part. Full report: Bailii. Appeal by mother against case management decision in proceedings to enforce and vary child arrangements order. Appeal dismissed. Full report: Bailii. Application by father for return of children from China.Held that the children were habitually resident in China on the date they were unlawfully retained under article 10, and therefore the Court had no jurisdiction. Full report: Bailii. Appeal by mother from interim care orders made in respect of two young children. Appeal allowed, on the basis that the judge subjected her to improper pressure, as a result of which she did not freely consent to the ICO. Full report: Bailii. Case concerning issue of whether a ward should travel to India to give evidence in the trial of his mother, who is charged with his father's murder. Full report: Bailii. Judgment considering whether an adoption application in respect of a child placed for adoption in Scotland with Scottish adopters can be determined in England. Full report: Bailii. Appeal by mother against interim care order in relation to 8 week old child. Appeal dismissed. Full report: Bailii. Proceedings concerning the arrangements for a 16 year old, as between her father and aunt. Full report: Bailii. Application under section 18(1)(h) of the Mental Capacity Act 2005 for the settlement of property of child on trust. Full report: Bailii. “This is a missed opportunity: a very disappointing outcome to a process into which many professional organisations and individuals invested considerable time and ideas. “We note there is a promise of more money for litigants in person. We sincerely hope this translates into considerably more resources for those organisations such as ourselves which are working with these people ,and providing accurate and bespoke information and guidance free of charge. “The report offers a number of broad, wishy-washy statements and recycled money which kick down the road the can of effective support to those who most need it. “We are afraid that offering legal help hubs in GP practices smacks of a bid to create an eye-catching distraction from the real issues at stake for people suffering the consequences of being denied legal aid. “The delay in reviewing legal aid eligibility is baffling: all Ministers need to do is increase the threshold to allow more people access to legal aid: and this would be a great help in driving up numbers going into mediation which is, after all, supposed to be a government priority. Judicial guidance on the exercise of parental responsibility - As in the 2004 case A v A. Wife fails to prevent arbitration award being put into effect - The rather more recent case BC v BG. A public health approach to family justice - As considered by the Nuffield Family Justice Observatory. Husband fails in lump sum claim centred on trust funds - The judgment of Mr Justice Holman in the case Daga v Bangur. 500th edition of the Newsletter! And they said it wouldn't last. I have just sent out the 500th edition of the Family Lore Focus Newsletter (yes, it's been going for ten years!). 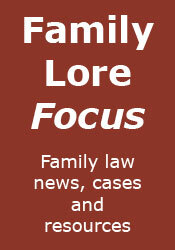 The Newsletter is a free weekly email sent to subscribers, containing links to all of the the top family law news stories, cases, legislation, articles and blog posts that were reported on my sister site Family Lore Focus that week. The links come from across the web (not just one site! ), and are all free to view. In this way, the Newsletter is intended to keep the reader up to date on the latest developments in family law, with no expense, and the minimum of effort. Family lawyer organisation Resolution and The Law Society have issued a joint note for family lawyers in England and Wales, with recommendations in the event of no-deal in relation to Brexit on areas of family law including divorce, maintenance and children proceedings. Full story: Family Law. A family judge has warned family lawyers not to take a 'lackadaisical' approach to case preparation after the wrong person was summoned as a witness to attend court in a case involving a seven-week old baby who suffered burns covering her groin area. Full story: Law Society Gazette. See Re K & C (Children: Finding of Fact), below. A divorcing husband’s income was equivalent to that of senior judges and more than sufficient for his post-divorce needs, the High Court has ruled. Full story: Legal Futures. See Daga v Bangur, below. A test in the family courts will be the next step in exploring fully video hearings, against a backdrop of widespread concern about the technology among judges, it has emerged. Full story: Legal Futures. Findings do not support roll out of the procedure in its current form. Full story: Family Law Week. Appeal by mother from a fact finding judgment given in the course of private law proceedings concerning four children. Appeal allowed. Full report: Bailii. Care proceedings. Appeal by childminder against findings of fact in in relation to injuries suffered by child. Appeal dismissed. Full report: Bailii. Application by husband for a lump sum payment, or other capital provision from the wife, focusing on two discretionary trust funds of which the wife was the settlor and is a beneficiary. Full report: Bailii. Care proceedings concerning twin. Fact-finding hearing to ascertain who caused the injuries to one of the children. Full report: Bailii. Application by W that the final arbitral award should not be made an order of the court. Application rejected. Full report: Bailii. The view from our new President’s chambers - A quick look at the first View à la McFarlane. Report findings do not support roll out of Settlement Conferences in children cases - Looking at the recent ALC report. Husband fails in appeal against costs order, despite winning case - As in Lemmens v Barbara Brouwers (Ex Lemmens).